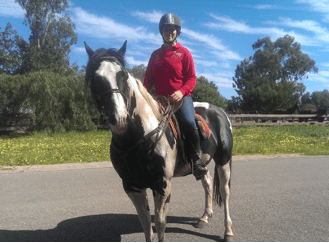 Julie Marshall from Murray Bridge, SA, shares this hair raising story about how she and Pirate, her Paint Stallion, recovered from a terrifying road accident, ultimately with the help of herbs and flower essences. “Pirate came to me as a gift for my fiftieth birthday, he was three months old. He was perfect in every way and friends in the show know encouraged me to leave him entire because of his bloodlines and conformation. At just short of three years old we started saddle training him, and within 6 months, he was road ridden regularly , alone and in company. Pie was bombproof, and riding him was like riding a twenty year old Clydesdale. On a beautiful Sunday morning one of my students, Bronwyn, and I had been on a splendid twenty kms ride and were about three kms from home when an ignorant driver in a medium rigid truck complete with tool boxes and ladders, approached from behind. We were on a slight downhill gradient and had clear visibility for say two kms, on the gravel strip along the edge of the road unable to go further back due to the ground cut out when the road passed through the hill. When we heard his approach it did not cause alarm as both horses were traffic sound and there was no oncoming traffic and we assumed he would give us a little room. BUT he stayed on his side of the road and passed so close that when impacted from the rear by the pony my arms must have risen and my elbow was clipped by the truck’s rear view mirror. Pirate moved like light and he tackled the cut out cliff to our left and I must have been untidy at the top because when he fell through the cattle fence a very short distance away I hit rocks at the gallop breaking six ribs and pulling my shoulder from its socket. Bronwyn broke her wrist and the truck failed to stop. Pirate was convinced at that moment that a truck had hit him. Bronwyn‘s horse was still on the road verge, Pirate after a bit came back to his mate and we were confronted with the task of finding the gate of a large paddock with cows in it. The pain was akin to child birth, I was coughing blood and found it quite hard to think clearly. After a long time and a mass of yelping we had retrieved Pirate and somehow had to get back on. Bronwyn’s hand and wrist had begun to swell and I had started to tremble. We lined the horses up against a couple of boulders, remnants of the road excavations many years before, and struggled aboard. Three weeks later I was still sleeping sitting up in the lounge unable to bear the pain of the standing to lay down action. Six weeks later, I was well enough to ride, but did not expect what I had. Pirate was fragile, fearful, nervous and explosive. Not even a car could pass without him rushing away, even just riding he was tucking his rear in at my slightest movement. I was still sore and elected to ask my son to work Pirate because he was damaged and jumpy. Dwayne saddle trained horses for years before he got his current job, he’s tall ,thin and the closest thing to a horse whisperer that I know. During Dwaynes few rides Pirate showed improvement but was still dangerous to say the least. I rode Pirate once or twice a week for one year, struggling to control my own fear of Pirates fear and reactions. Pirate is the most docile stallion I have met but when a car would come along he would plunge into or through fences, he jumped the bonnet of a neighbour’s little car and he would buck his heart out if long grass touched his belly. When not under duress his mouth is light as a feather, but as soon as he has fear I have nothing, absolutely nothing, and being a quarter horse stallion bending his neck to put his drive out was humanly impossible unless I was quick enough to catch him before the fear had stiffened it. Then out of sheer despair I contacted you, I had tried everything I knew, but the damage could not be trained out , his nervous system was shot. He was trying so hard but could not stand pressure of oncoming traffic. Your prescription was not an immediate fix but within three months a car could pass with only a small tuck, and by twelve months his head lowered during riding and faster and noisier cars can pass with NO reaction, moving trucks can still be an issue at times but a controllable issue now. I will always be indebted to you for saving Pirate, and I am your biggest promoter. All I can say is that Julie is extremely brave and and an incredible horsewoman and without her perseverance, Pirate would not have recovered. From the outset I told Julie not to expect a quick fix because Pirate’s adrenals were still in overdrive and I needed to get them back into balance with herbal extracts and reduce his emotional trauma with flower essences. I used Hawthorn as a restorative due to it’s ability to stabilise heart rhythm, three nervine herbs which is highly unusual, but they were needed, Mugwort, to reduce nervous tension caused by sensitivity to sight, sound, touch and noise, Oats, a nervous system restorative and heart tonic and Lime Flowers for nervous tension and anxiety especially with elevated heart rate. And Liquorice and Withania as adrenal tonics. These herbs worked together synergistically. The Flower Essences I chose were – Aspen, Larch, Mimulus, Honeysuckle, Star of Bethlehem, Cherry Plum and Rock Rose. The flowers and herbal extracts were mixed together and syringed into Pirate’s mouth twice daily over a few months. I treated Pirate several years ago so I was delighted to hear from Julie recently to tell me that he was still going very well.